Diasporas are important agents of knowledge transfer to their home countries and they serve as an interface for socio-economic integration across cultures and boundaries. They also bring back to their country of origin knowledge, skills, and cultural capitals thus contributing to the socio-economic integration of their country with the rest of the world. The Ethiopian Diaspora too has been instrumental in facilitating the local global interactions. In addition to being strong contributor to economic development through investment, the Ethiopian Diaspora has been playing an active role in the political sphere, by presenting high pressure to the government and by being a bridge for the cultural learning process. There has been an increasing interest by sending countries to draw on the potential of their citizens abroad to strengthen their socio economic growth. This initiative is a result of both a changing nature of the world since 1990, meaning countries have become more and more interdependent, and the realization that, in this era of knowledge economy, their economic growth depends on the transfer of skills, capital, and innovation mobilized from both internal and external sources. The role of the Diaspora to this end is significant as it embodies knowledge and innovation. Diasporas can be effectively used in an environment where the state leads the process of Diaspora engagement and sets its policy priorities. The best use of Diasporas can be made in strengthening private public partnership which involves the Diaspora in policy formulation and implementation. This in turn will give it the ownership as a viable actor in the national affairs. These policies would be very effective if they target areas where poor countries like Ethiopia do not have the internal capacity needed. Therefore the critical involvement of the Diaspora in setting up institutions that can help the country to better integrate into the global knowledge economy is significant. Given that a systematic Diaspora state relationship is an emerging area of cooperation, studying the experiences of the Ethiopian state Diaspora engagement will shed light on how developing countries make use of the knowledge they acquire from their Diasporas to better cope up in the global knowledge economic system. In this regard it is important to analyze the challenges and opportunities of engaging skilled Diasporas. The limited studies carried out on the Ethiopian Diaspora predominantly focus on the remittance part of the Diaspora’s contribution and they purely approach the subject from an economic perspective. The second category of the literature on the Ethiopian Diaspora dwells on the political involvement of the Diaspora. 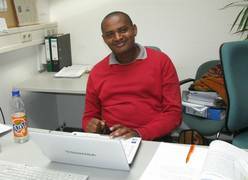 Lyons (2006), for example has done some work on the Ethiopian Diaspora focusing on their active participation during and in the aftermath of the contested national elections in 2005. A third category of the literature on the Ethiopian Diaspora, deals with the general migration trend in Ethiopia and on its historical push and pull factors. In that it is a conventional migration research and does not emphasize on any partnership these migrants establish with their home land government in policy areas. In this regard, this research is interested in investigating the role of the Diaspora, particularly the highly educated segment of the Diaspora in the transfer of knowledge that are not easily available locally but that help the country to have a knowledge economy which is globally competitive. And the thesis will attempt to fill in the knowledge gap that exists regarding institution building (case study the Ethiopian Commodity Exchange Authority) through a partnership between the Diaspora and governments. It will also attempt to show how this institution facilitates Ethiopia’s entry to the global market system and its economic growth. Furthermore by taking Ethiopian Diaspora networks which are active in knowledge transfer to Addis Ababa University, the study will analyze how these networks engage with local institutions. MA in Peace and Security Studies, (Joint Degree of the Institute for Peace and Security Studies (IPSS), Addis Ababa University (AAU) and United Nations University for Peace, Addis Ababa, Ethiopia.